Summary: This article will show you different ways to export Android contacts to Excel (CSV & XLS), enabling you to easily edit or print contacts from your Android phone. Losing important data on your mobile phone can cause you big trouble in work and life. For example, you stored hundreds of contact phone numbers on your Android phone, namely Samsung, HTC, LG or Motorola, and accidentally you formatted or lost the phone device some day. It is easy to purchase a new phone, but how to retrieve back the lost contacts, which are closely related to your work? You must regret not backing up these contacts on a computer. Well, there is no regret medicine! In case of above situation, we will teach you how to backup Android phone contacts to computer and save them as readable and editable Excel files. You know that the same as text messages, contacts on a mobile phone can not be accessed on computer, let alone read and edit them. To save Android phone contacts to Excel files on computer for easy editing and viewing, you can have a try with the Android Contacts Exporter - Android Assistant (Windows/Mac). Under the help of this program, you can export Android mobile phone contacts to computer easily with 1 click. You are allowed to choose to save the exported contacts as Excel CSV or XLS format, then, you can view and even edit contacts according to your needs. Of course, there are more available contact formats for your choice, including CSV, XML, HTML, Outlook, BAK files. As for Android contacts, you can use the Android Contacts Assistant to freely preview, add, delete, edit, modify, export (backup) and import (restore) them on PC/Mac as you like. 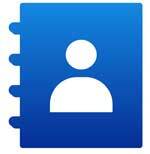 In a word, you can freely manage Android phone contacts on PC/Mac as required. Not only contacts, the Android Assistant can also help you transfer text messages, photos, videos, music, apps and more files between Android-based phones/tablets and computer with ease. You can download the free trial version of the program to have a try. Please choose the right version according to your computer system. For the first step, launch the installed Android contacts exporter software on your computer and connect your Android phone to the same PC via a USB cable. Make sure the USB debugging on your Android phone is enabled. Otherwise, you need to follow the instructions on the program window to open the USB debugging, just like the following picture shows. After that, the connected Android phone will be detected by the program. Failed to connect via USB? Once detected by the program, the main information of your Android phone, as well as the whole data of your mobile phone will be shown and listed on the top of the menu, including apps, music, photos, videos, contacts, and so on. Click the "Contacts" button, and enter the "All Contacts" folder. Now you can preview all contacts displayed one by one. You can mark your needed contacts with those choice boxes.Then touch "Export" and you are allowed to choose the output location, as well as the output file format as "CSV" or any other contact format you need. Just give the Android Assistant a shot! First of all, you are required to transfer your contacts from your Android phone to Gmail if you have not. To do so, please go to "Contacts" > "Settings" (or "Menu") > "Merge with Google". then install Gmail app on your Android phone, tap "App Drawer" > "Settings" > "Account and Sync" > choose Gmail account > open "Sync Contacts" > "Sync Now". After all these steps, you can sign in to your Gmail account on your computer. Now, please tap the Menu icon next to your profile picture and select "More" option to show more options. Simply tap on the "Contacts" option . Then tap on "More" button on the left to select "Export" option from the pop-up options. The contact list with checkboxes will be listed in the right panel. Please tick off the contacts you want and click "More" > "Export" button. 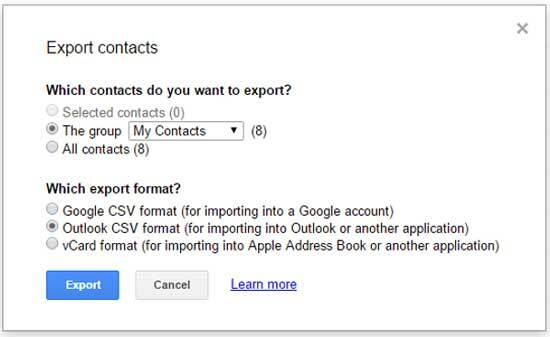 From the pop-up window, which asks you which contacts and formats you would like to export, just select "Selected Contacts" and "Outlook CSV format (for importing Outlook or other applications) and click "Export" button below. When the Android contact transfer is complete, the contacts will be saved on your computer. 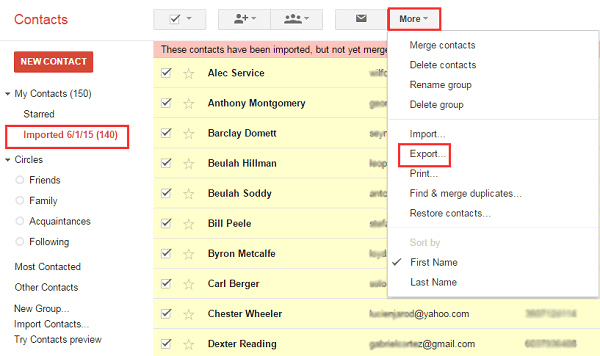 You can open the contact folders to view, manage, and edit Excel contacts as you want. As the name suggests, this program can be used to convert contacts to Excel format. You can take use of it to convert contacts on your phone to an Excel file with a single click and then email the file. By the way, the full version of this app is free, so you can try it for free. Contact Backup - Excel and Email, also known as C2X, is a reliable tool for backing up contacts. It can read every detail of all contacts and convert them to Excel file and email the file to you. This means you have the freedom to download and view CSV or XLS files on your phone or computer. It is worth mentioning that the software is easy to use and has no ads. So you can download and try it out from the Google Play store.